My landlord is fumigating his bungalow, and this morning they turned off everybody's gas. No heat, no hot water, no dryer, for three days. He did give us a hotplate and fifty bucks "for a nice dinner." Aaw. faux-laroid created by desert fete using this process. Oh god, sounds like a fun weekend. I might be more bummed about no dryer than I am about no hot showers. Weird? 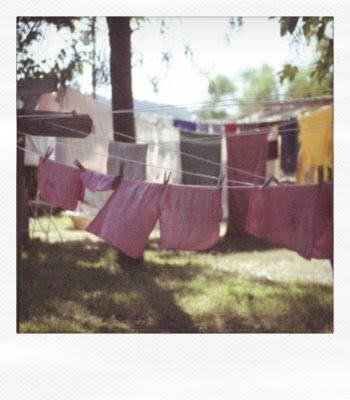 I love photographing laundry on the line. This image is so sweet and soft. LOVELY! did i ever mention where this came from? I took it while doing research for school. Visiting a secluded. hippie. christian. farm. for real. and kind of scary. sometimes I feel like I live in a secluded. hippie. bungalow. are you perusing the esb archives...? i wish. putting together a presentation of my research for tomorrow and i used that image; it reminded me of your post so i took a little blog comment brake. so honored to see all time wedding photog guru liked it. anyways, the hippie seclusion was not the scary part.